As any girl can tell you dresses can be way comfy. Especially loose, flowy dresses. Add in pockets and you're extra special lucky because that my friends is the perfect dress. 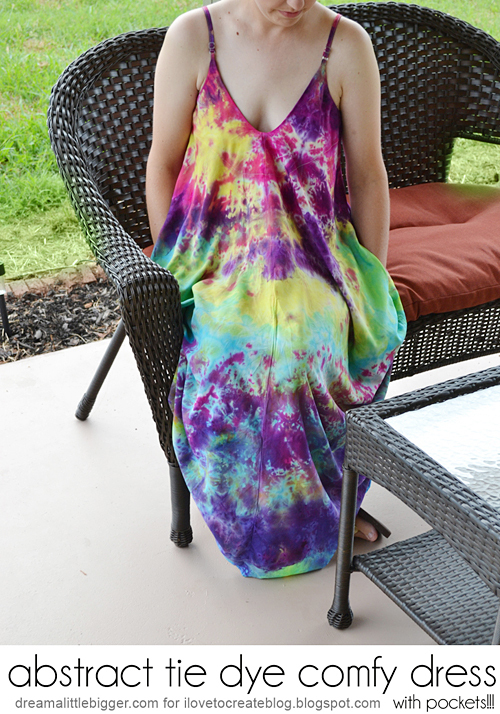 My perfect dress quickly got stained and so it met up with some Tulip tie dye and I must say that it's the prettiest dress I have in my closet these days! 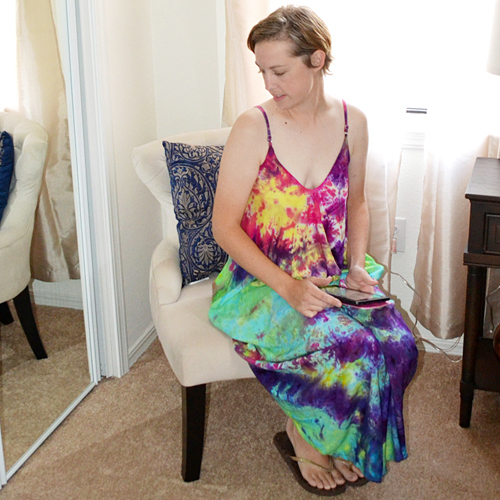 Here is my dress.I got it from Amazon (search May&Maya maxi) for under $23. 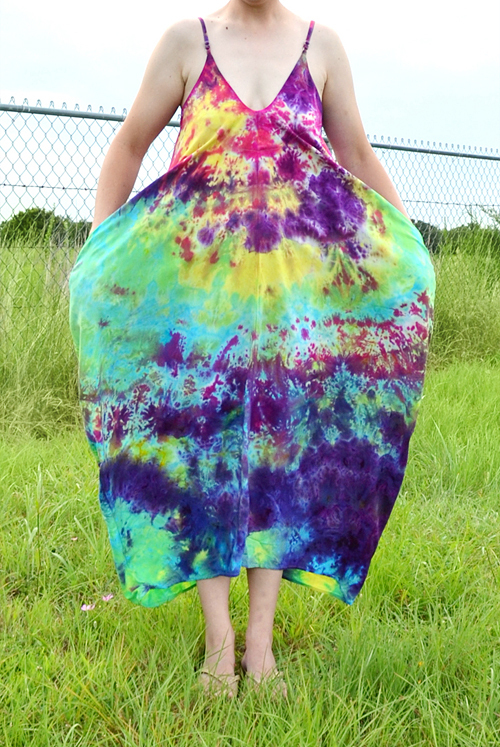 It's 100% rayon and therefore totally dyeable! 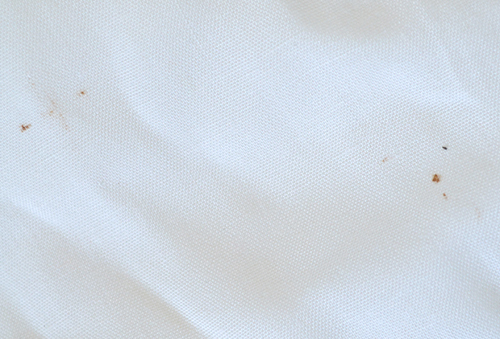 I had my dress for, like, 2 seconds before I had brown dots all over the dang place.I have NO idea how I did this, what that stuff is or where it came from. 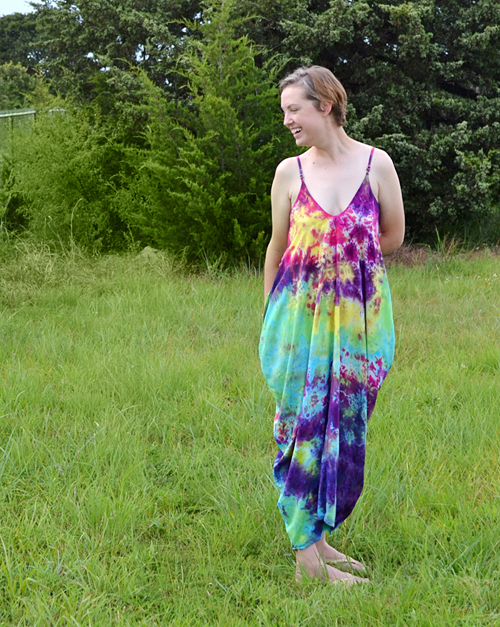 Luckily I was planning on dyeing this baby anyway so it wasn't a huge loss, but dang! 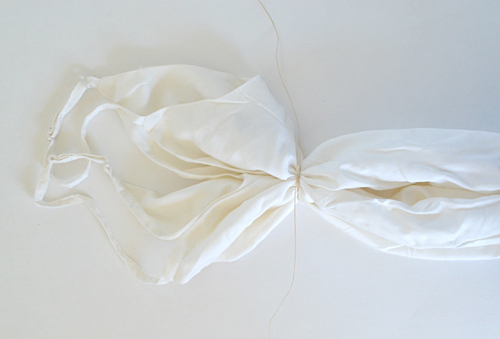 Grab the top and bottom of the dress and lay it in a line like above. Tie off a section just below the straps. And a quick tip, here... I'm allergic to latex which also makes me allergic to the rubber-bands that come in the kits. Most of the time I use waxed cord I get from the leather crafting section of the hobby store for super cheap. Works just as well and I don't have to worry about getting a rash. Now take your dress and smoosh it together from the bottom to the top. This doesn't need to be anything fancy, just grab it and push it all together. This is really going to help our abstract look of the dye on the dress. Continue tying off sections down the end of the dress keeping it as cinched as possible while you go. Band every 2-4 inches for the best effect. Once tied off smoosh the dress together again as tightly as it will fit. This is the color kit I used for my dress. Inside is purple, magenta, turquoise, lime and yellow. I like to dye my projects over a cookie rack. You know, those wire things you put hot cookies on to cool them after they have been baked? You can get 4 for less than $2 most places. I place mine over a plastic tub or a cat litter pail (what the litter comes in from the store. Here I am using two tubs together because my dress wouldn't fit exactly over the smaller tub. 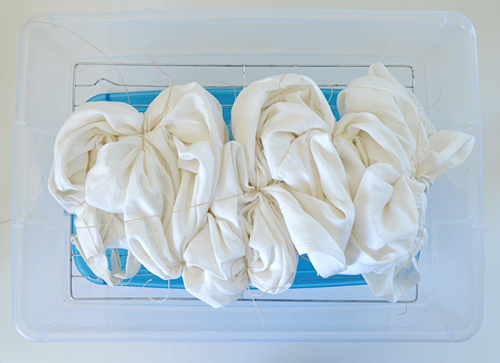 Start dyeing your dress by randomly placing colors over this first side. 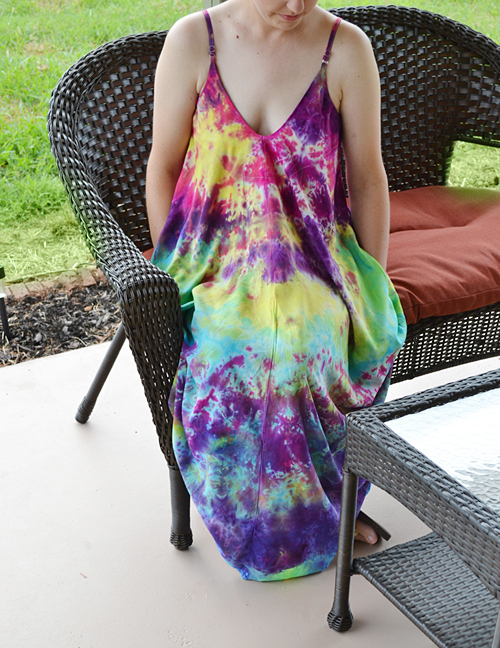 If your dress is rayon like mine, the dye will kind of bounce off a bit so go slowly and hold the bottle close to the fabric so it soaks in well the first time. 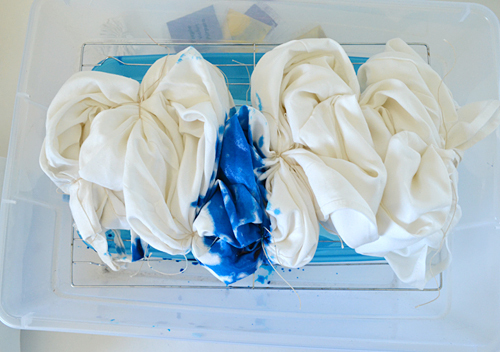 Continue dyeing placing colors randomly in small and large areas. 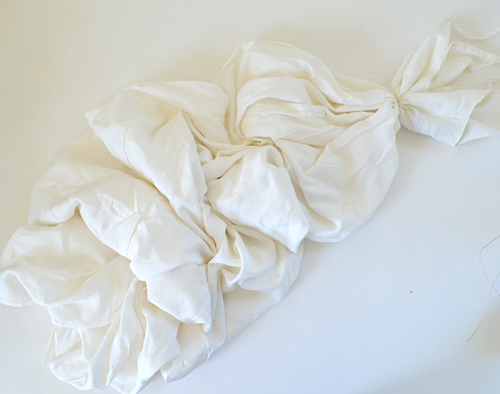 For less white, soak the fabric well. Turn and repeat for the second side. Allow to sit for at least 6 hours and then rinse until the water runs clear. 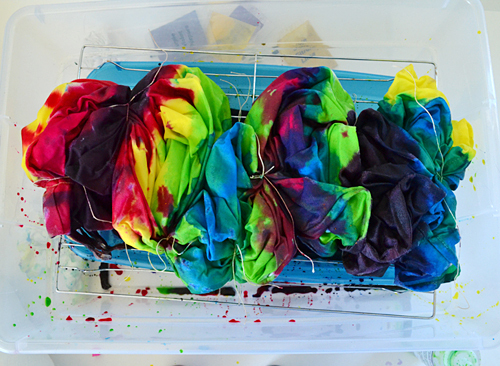 Toss in the washer with no soap or fabric softener to remove the rest of the dye. I use the shortest cycle because you don't need tons of time. Be sure to run by itself so that the dye doesn't ruin other clothes. 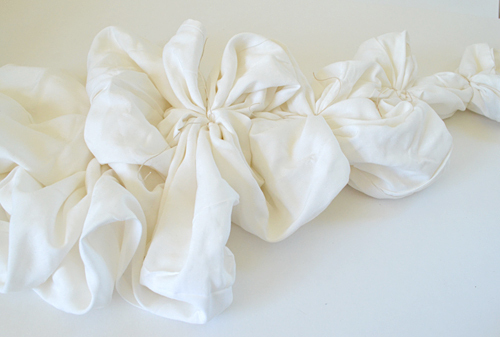 Dye catching sheets you can purchase in the laundry detergent are super helpful and will take on all stray dye keeping the white areas of your dress crisply white. My dress is kind of a funky shape but I love it! The rayon took the color so well and it's bright and vibrant! I wore it out on the town and I was so pleased with how comfy it was and the fact that I had pockets. My hands were in those pockets almost constantly! 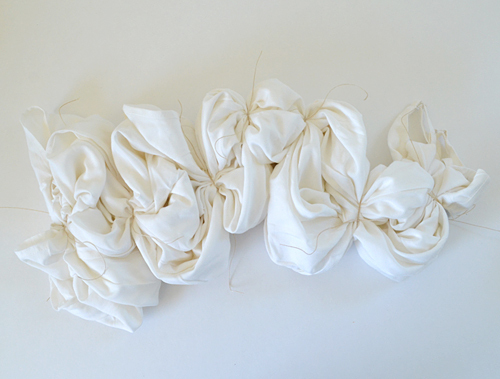 If you loved this project I'd love to see you over at my blog Dream a Little Bigger! 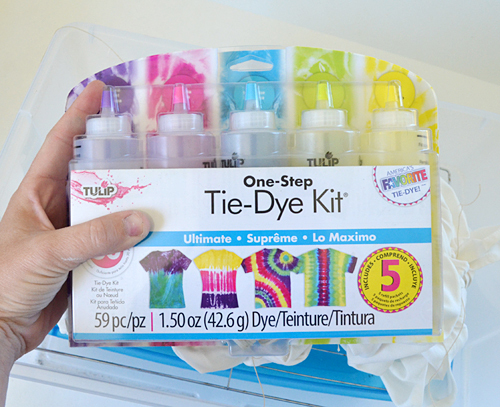 How many dresses or t-shirts do you think you could dye with 1 kit?thinking this would be s fun kid project now that day camp is over.